BusinessWith addresses both existing and newly established businesses, entrepreneurs, as well as sole traders and business executives who wish to maximize their efficiency and profits, expand or redesign their business activities or even maintain their profitability in a changing environment. BusinessWith, provides entrepreneurs with Business Coaching and Business Mentoring services. We offer to businesspeople tailored consulting and guidance in addressing complicating business issues and formulating their vision for the evolution of their business. BusinessWith is an invaluable partner for every successful business. They provided me with consulting and guidance, necessary for the development of every business in the highly demanding modern business environment. They address every business issue and challenge with efficiency and effectiveness. Under the guidance of BusinessWith my company managed to tackle the business issues raised by the economic crisis. 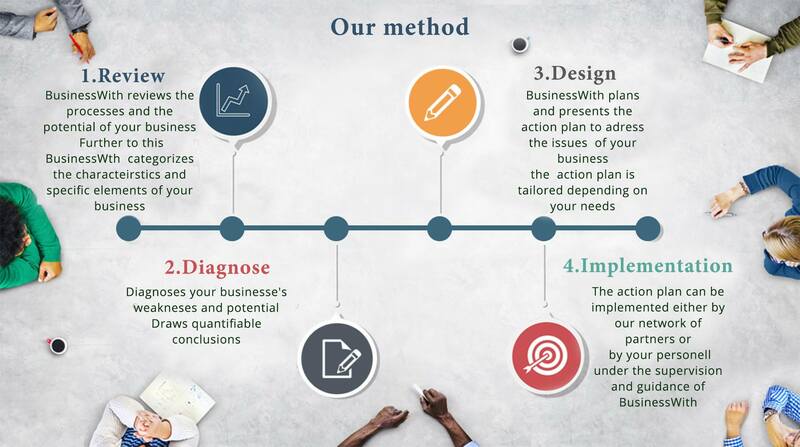 BusinessWith is always one step ahead and has become a necessary partner for the everyday business issues and negotiations, as well as for the realization of my business plans. BusinessWith offers reliability, experience and high professionalism and I strongly recommend it for every entrepreneur and business.